The new screen has been designed to make application adoption less intimidating for users. They will no longer have to worry about installing (and later uninstalling) applications – and their associated profile boxes, left-hand nav buttons, profile links, and email lists – just to try them out. 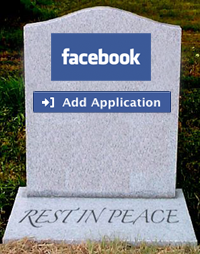 But the change should also slow viral growth patterns – especially for newer, smaller apps. 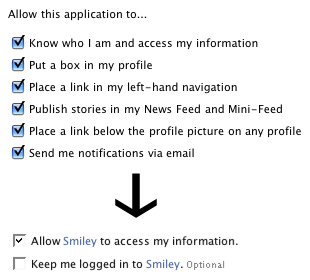 Gone is the ability to put profile boxes (which give apps considerable visibility) on users’ pages upon first access. To add a box (on a special apps tab no less), users must later decide that they like it well enough to click on a special canvas page button.